Near the National Park we had a stop at the banos (toilets) and for a 15 minute chance to explore. Ben, being energetic, lead us down to the shore of the Lake Argentina for a good view. I touched the ice cold water, not something you would want to swim in. We learnt that natives have some houses / huts in the a national Park but when they die the houses will be removed and they can’t sell them. Next stop Was Perito Moreno Glacier and we decided on taking the longer hike from the east side. At this point the group indicated we would also take a boat to approach the west side for a better view but later decided we didn’t need this. 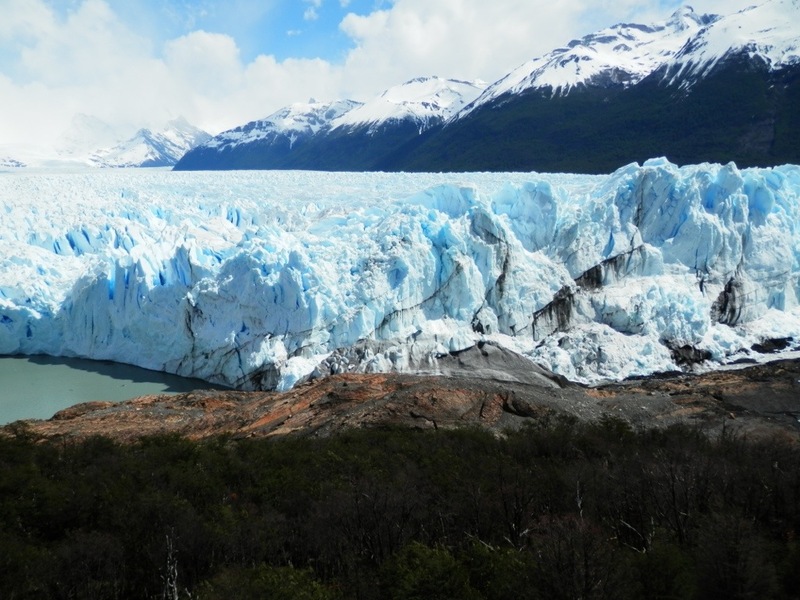 Perito Moreno Glacier loses about 2 metres each day so there is always pieces falling off. After lunch I was lucky enough to see a major piece break off and the resulting loud crackling noise, I captured the aftermath on video. Stunning does not approach this experience and I was given an energy boast witnessing it. In the end I took all the hiking paths and got some great views. The glacier at its face is approximately 160 metres tall with about 100 metres exposed. The glacier divides two lakes and every few years a hole develops to let the water flow. This then results in an eventual collapse of the significant part of he glacier. I saw an imagine in the gift shop of this amazing event and the startled tourists. There was a sign saying 48 people had died being to close to the glacier when the collapse occurs and that ice is thrown 40 metres into the air. In other words don’t get to close. Because the glacier is so unstable no one can hike / trek / climb at the face. An amazing place that the photos don’t do it justice. On the return journey it was easier to stay awake as we lowered the van temperature via an open window. The weather actually was brilliant in the second half of the day. A few of us discussed Norway, Australian and Argentinean drinking laws. Our local guide gave us her opinions on Chilean and Argentinean tensions, basically saying on the frontier here they are all in it together. Back at the hotel I was finally able to upload photos and stories from the last few as and work out how to get a replacement iPhone. For diner we went to a local restaurant famous for lamb. It was fine however nothing beats South African Karoo Lamb in my opinion.